A well considered and deeply prepared trio outing in the footsteps of the legendary Sonny Rollins trio. Why the Jazz trio, you might ask? Well, for starters, one might only have two musician friends in town. A historically more significant cause involves a principle of subtraction. Perhaps after a period of musical reconnaissance, it becomes clear to a tenor saxophonist that the harmony instruments represent an encumbrance. In order to sort out one’s ideas and construct a personal but maximally efficient language of communication, the piano or guitar with all their chords and attitudes must go. Lessons from history highlight this process and are worth revisiting. In 1956, Sonny Rollins took his sax and an ersatz cowboy outfit, but no pianist , “out West”, in what would be a landmark session. What emerged on Way Out West, was the ultimate “thinking man’s” approach to improvisation on a record of enduring charm. In 1960, Lee Konitz followed with Motion, a remarkable session on which he demonstrated the cliche-free linear approach of the Lennie Tristano school in brainy and dazzling deconstructions of jazz standards. Finally, Joe Henderson dispensed with the over-determining organs and pianos of his Blue Note years in his Village Vanguard performances, allowing his mercurial wit and irony to engage the listener in entirely new ways. All three of these records cast long shadows, but it is the first-named that seems to hover, benevolently it should be said, over this particular session. Don Braden has more than a couple friends, having played with all the greats in an already lengthy career, so we must assume that he has arrived (for the first time) at the trio concept by the same route as Sonny, Lee, and Joe. His erstwhile colleagues, finger-wiggling virtuosos, boisterous organists, and slashing guitarists, did not get a call this time. Instead, Braden went into the studio with long-time associate Joris Teepe and two drummers, Gene Jackson and Matt Wilson, who split duties on the kit. What emerges is titled “Conversations,” which might be too casual for what seem more like interrogations of the jazz tradition as well as a self-imposed challenge to make a fresh statement in an exposed setting. It is also a great record and worthily takes its place alongside the aforementioned Giants. Co-leader Joris Teepe demonstrates his big sound and agile lines to great advantage throughout. He also contributes one striking chart, a etude-like duo with fleet contrary motion and sharp turns, in what feels like a dance or a duel. The first track is a perfect triangle of interactions. The tenor delivers the Chick Corea “Humpty Dumpty” line with authority while Joris Teepe’s walking bass reaches high and low with muscular quarter-note strides. Matt Wilson roils up a fine tempest with the sticks. Elvin Jones’ “Three Card Molly” switches out the drummer seat for Gene Jackson, in a mind to nod towards his elder with a huge floating drum sound which overwhelms the slender blues theme. By the end, the Coltrane imitation is persuasive, although scarcely original. On both “Goodbye Porkpie Hat” and “Footprints,” bass and tenor negotiate charts that are overdetermined in their associations. That they succeed in this has less to do with willful distortions or paraphrase and more to do with their superb interactions and extreme economy. On the latter tune, the group boldly dissects the overfamiliar Shorter theme. Melodic inquiry and clever antiphony ensue in what becomes a very free and somewhat shambling discourse. “Stolen Time” features Don Braden’s flute, providing confident improvisation on a non-memorable tune. Two standards follow: “It’s You Or No One” and “Our Love is Here to Stay.” The trio is happy to pay homage to the great Sonny Rollins in method and tone while bass and drums swing mightily but without the over-assertion that intrudes elsewhere. (The studio fade on the latter deserves a small fine.) One cannot begin to imagine how an addition of piano would be anything other than dilution. Fans of Don Braden will not want to miss this outstanding record. 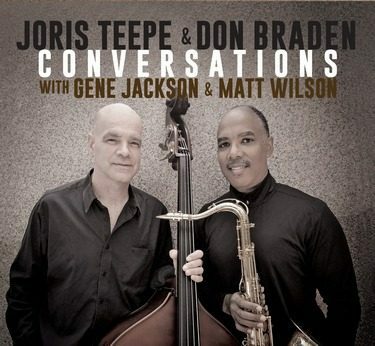 Bassists will be knocked backwards by Joris Teepe’s cogitations. Even more, those who have a fondness for the saxophone trio will instantly recognize that this is a hard-won achievement of master musicians.